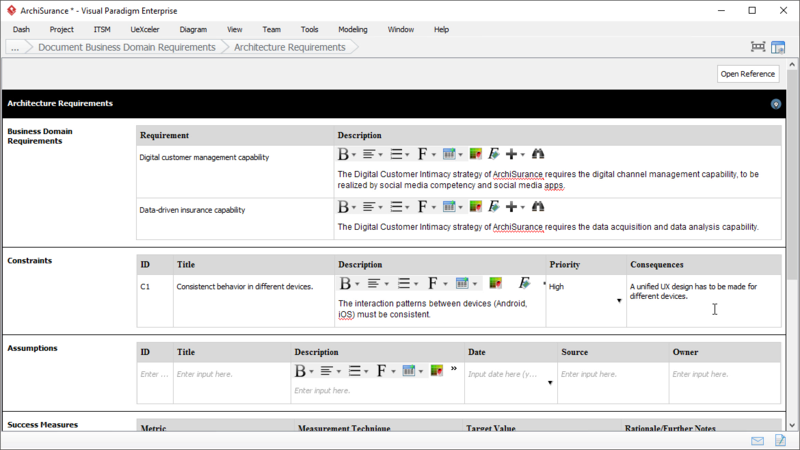 Architecture Requirements Specification is one of the TOGAF deliverables you can create with the TOGAF software. The Architecture Definition Document provides a qualitative view of the solution and aims to communicate the intent of the architect. The Architecture Requirements Specification provides a quantitative view of the solution, stating measurable criteria that must be met during the implementation of the architecture. The Architecture Requirements Specification provides a set of quantitative statements that outline what an implementation project must do in order to comply with the architecture. Now, fill in the form of the architecture requirements by documenting the business requirements identified in this phase, and the constraints, assumptions and success measures associated with the requirements.